Need a delicious fall dessert recipe? 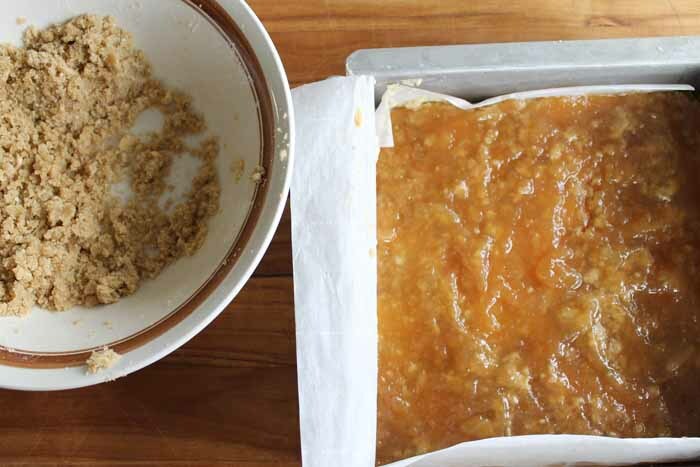 Look no further than this pear crisp recipe with salted caramel. 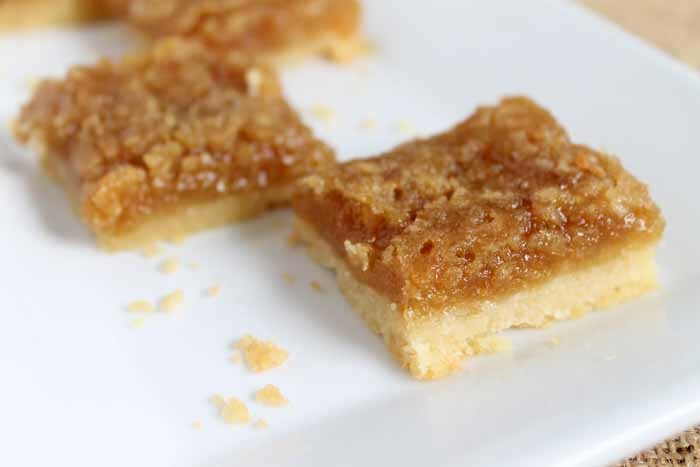 A delectable shortbread crust topped with a sweet salted caramel pear butter that is out of this world. Bake that all together and you have one dessert that you cannot pass by! This post is sponsored by Newell Brands, Makers of Ball® Fresh Preserving Products, however all projects and opinions are my own. 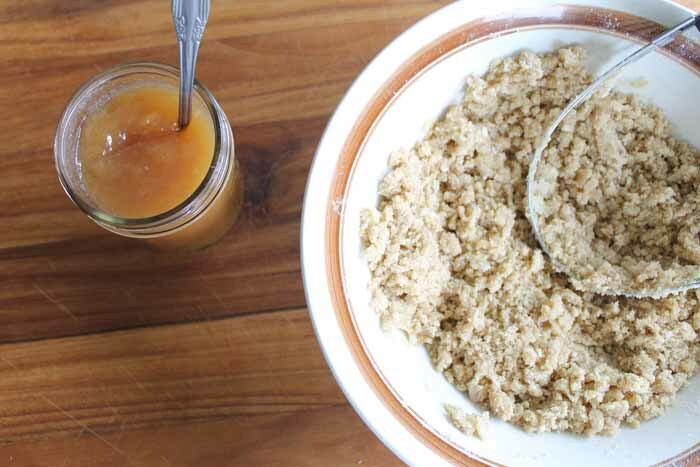 Start by canning your own salted caramel pear butter with this recipe. 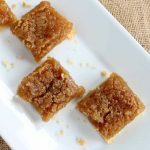 This recipe is great served up with your biscuits in the morning however it also makes a great filling for these bars. The recipe for canning them makes four half pint jars so use one to make your pear crisp and keep the others for breakfast or to spread on toast. You might even want to double the recipe to have plenty to give for gifts during the holidays. Yes it is that good! 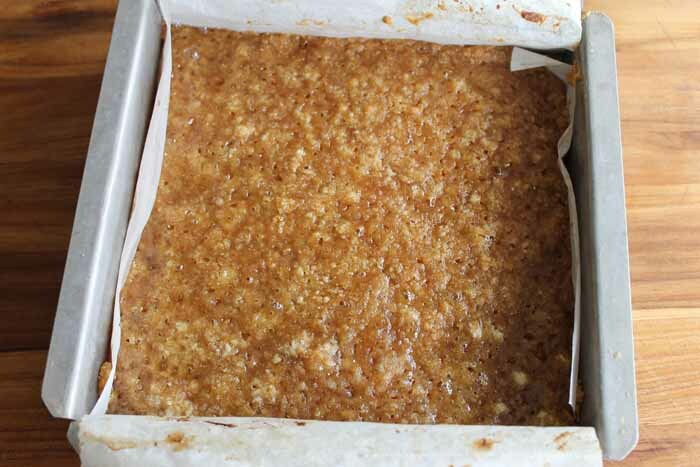 Preheat the oven to 300 degrees F then line your 8×8 baking pan with parchment paper. You want this to cover the bottom as well as come up the sides. Then gather your ingredients for your shortbread crust. Place 1/2 cup of softened butter into a mixing bowl then mix with a mixer on high for 5 minutes. The butter should turn white in color. Add in 1/4 cup sugar, vanilla, and salt. Mix well then add in 1 cup of all purpose flour. Press this mixture into your lined pan then bake in the oven for 15 minutes. While your crust is baking, get your jar of salted caramel pear butter ready. You can also mix your topping. In another bowl, add 1/2 cup flour and 3/4 cup brown sugar. Then cut in 1/4 cup softened butter with a pastry cutter until the mixture is crumbly. When the crust is done baking, remove from oven and also turn up the heat to 350 degrees F. Immediately sprinkle about half of the topping mixture over the crust. Spread on the entire 1/2 pint jar of salted caramel pear butter. Sprinkle the remaining topping mixture on the top of everything. Bake for 30 minutes. Remove your pear crisp from the oven and then allow to cool. Place in the refrigerator for about an hour before slicing. 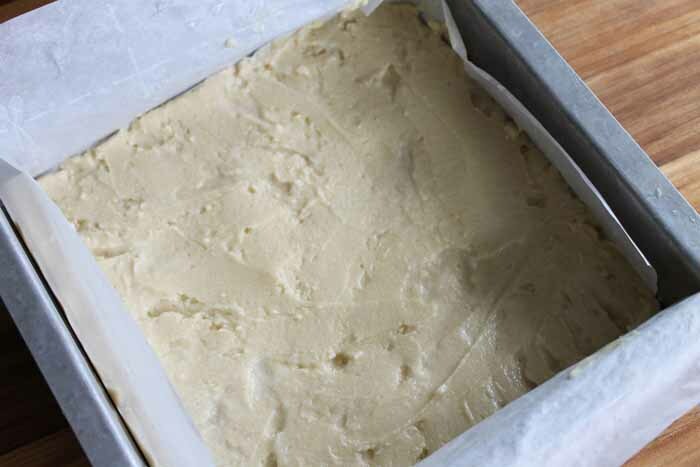 Use the parchment paper to lift from the pan and then cut into squares. Once cut into squares, you can dive in! 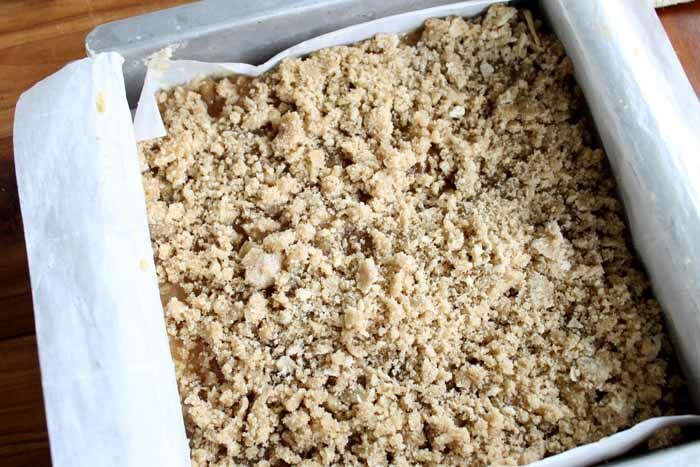 Your entire family will love this pear crisp recipe. I mean who doesn’t love salted caramel? These delicious and sweet dessert bars make a wonderful addition to fall. Whip them up for a weeknight dessert or a weekend treat. 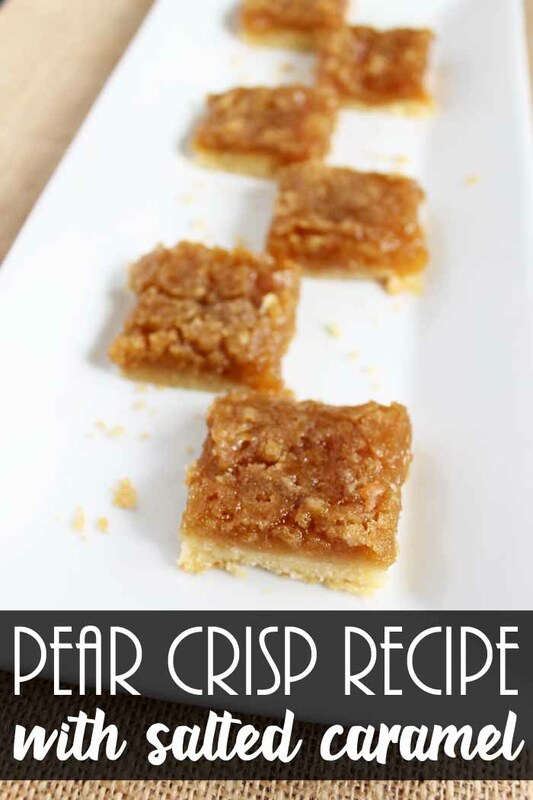 Either way, your entire family is sure to dive right into this pear crisp. 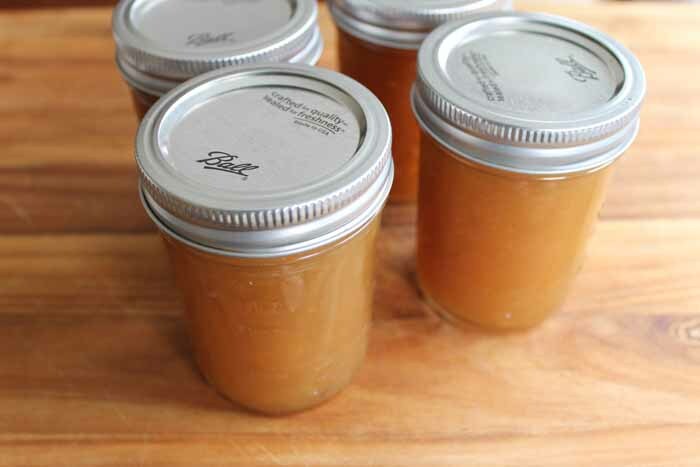 Don’t forget to make extra salted caramel pear butter while you are canning. Once you taste it, it will be your new favorite spread anytime of the day! Love this recipe and want to print it? Use the recipe card below!